For an action-packed, fun-filled Caribbean cruise vacation, plan a trip on one of the Royal Caribbean Cruise ships. While there are numerous ships to choose from, the Adventure of the Seas offers all its name indicates. This ship was launched in 2001 and can play host to more than 3,000 passengers. The Adventure of the Seas employs over 1,100 people, more than enough to see to the needs of each and every traveler. Don't you think that just by looking at photos of cruise ships you can almost feel the excitement of going onboard such a majestic cruise liner? Those who cruise for gourmet dining opportunities will love all the food options on board this Royal Caribbean Cruises ship. Casual diners can always grab a burger at Johnny Rocket's retro diner, and for those with a big appetite there is the Windjammer Cafebuffet. The Cafe Promenade offers 24-hour dining, important on a cruise ship with round-the-clock activities. There are three traditional cruise ship dining rooms and guests have the option of choosing assigned dining times or flexible dining which allows you to eat anytime within several three hour periods. Food choices range from healthy, low-calories choices, to ethnic specialties, to indulgent desserts and meat and potatoes meals. The Portofino is the jewel of the ship, featuring an Italian seven-course meal. Reservations and a cover charge are required for dining at Portofino. 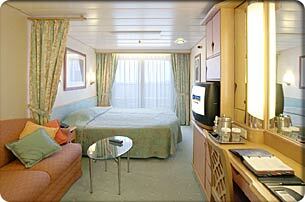 While you probably will not spend a lot of time on board in your room, you will be comfortable during your time there. There are over 1,500 state rooms, more than half of which feature ocean views and balconies. Many interior cabins feature views of the promenade, so while you will miss out on the ocean with a downgrade, people watching will be at a premium. Accommodations can be upgraded to junior, grand, and family suites. No Royal Caribbean cruise ship review would be complete without mention of on-ship entertainment. The ship prides itself on providing opportunities to well-seasoned cruisers and newbies. Day-time adventures include dance lessons, bingo, art auctions, seminars, rock climbing, humorous competitions, arts and crafts, and movies. If you would rather kick back by the pool all day, live music is featured and blends popular American songs with Caribbean flavored music. The promenade is also filled with strolling entertainers like musicians and jugglers. Evening entertainment features theatre performances in "The Lyric", bars, clubs, and musical performances. The ice rink is open at night. Besides, going for a romantic stroll around the ship and enjoying the moonlit seas is always an option! Of all the Royal Caribbean cruise ships, The Adventure of the Seas captures the fun of cruising. Whether you are planning your first cruise and trip to the Caribbean, or you have been cruising for years, you will enjoy traveling on this RCCL cruise ship.